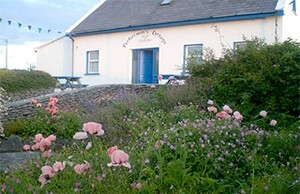 We have a unique location by the water’s edge on the western side of Inis Oirr, Aran Islands, only five minute’s walk from the pier. There are amazing views of the Atlantic Ocean in all it’s moods and it is unrivalled for it’s beautiful sunsets. There are four rooms, all en suite, with underfloor heating, free WIFI are tastefully decorated to reflect the location. The rooms are a haven of peace and privacy. This is a quiet location ideally suited for a peaceful relaxing break from the fast pace of modern life. South Aran Rooms are for adults only.